When planning your trip, it is important to remember the different types of transportation in Santiago, Chile. I’ve written about Santiago’s Transantiago System and the subway (Metro) before. These services play an important part of getting around the city. 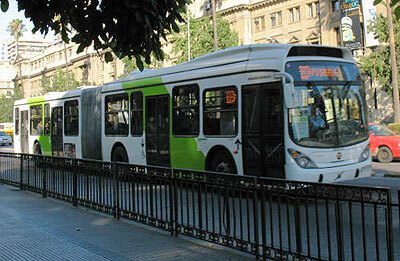 There are three main modes of transportation in Santiago Chile: metro, bus, and taxi. Each has some advantages and some things you should know. 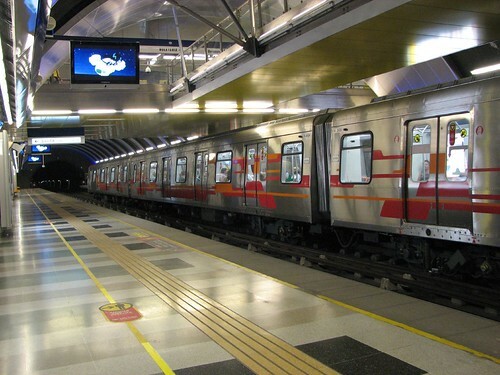 Santiago’s subway system is called the Metro. It’s modern, clean and efficient and has several lines that cover much of the city. There are three fare levels depending on what time of the day you ride; if you use the Metro during punta, or rush hour, you’ll pay more. Students and seniors get a discount. If the Metro has a stop near where you are going, it is the easiest way to get around. Many of the bus routes even begin or end at Metro stops, so you can take the Metro for the main part of your journey and the bus for a shorter leg. At the Metro station, look for a placard showing which buses stop at that station. The Transantiago buses, often called micros, come in different types that you should be aware of. The white buses with green stripes take you from one area of the city to another, and the colored buses travel around a single area. Unless you are headed to the grocery store, you’ll likely take the white micros more often — although there’s nothing small about them. Transportation in Santiago is much easier if you pay for it with Tarjeta Bip! You can buy the card at any Metro station for about $2 US, and then you load it up with money like a prepaid or debit card. The advantage is that you don’t have to keep cash on you or fuss with crinkly bills when buying your fare. Also, your card acts as your transfer when going from Metro to bus — just swipe your card within 90 minutes of the first ride and you won’t be charged again. Taxis in Santiago are black on bottom and yellow on top. They charge a base fare and then a rate for the distance traveled. They can be very convenient, but many people warn about taxi drivers taking advantage of travelers, especially those who don’t speak Spanish. If you’re with a Chilean who knows about transportation in Santiago, he can make sure the driver doesn’t go far out of his way to boost his fare. You can drive, but traffic can be a nightmare in a large city like Santiago. And unless you know your way around, it’s much easier to get lost when you’re at the wheel. Bicycling is also an option, though the main routes through the city are filled with cars and buses that may make biking difficult. Use your bike when you are traveling a short distance or using a less-common route. What’s wrong with walking? Although I recently used the Metro in Santiago, I want to stress that Santiago for the able-bodied is a very walkable city. There are no hills in Centro, and it’s a delight to hoof it from here to there, if you are not on a schedule. I probably walked 8 miles a day and just bought an ice cream everytime I needed a bano. Barbara: Walking is absolutely a great way to get around. What about COLECTIVOS? Don’t these exist anymore? They’re like a cheaper shared taxi with a route like a bus.